Build a better workplace with everything disc! We offer solutions to help you increase employee retention rates, increase sales, and work through conflicts in a productive way! Everything DiSC focuses on the complete learning process, offering solutions that learners can easily understand and apply in their daily interactions. Only Everything DiSC goes beyond the classroom with MyEverythingDiSC, a personalized mobile-first tool that helps learners use DiSC with their peers. Everything DiSC doesn't generate a data dump of information. It translates assessment results into a personalized narrative that's actionable and easy to remember. Every organization has unique needs. Everything DiSC provides versatile tailoring features that allow you to easily design a customized program that's right for your organization and time constraints. Learn more about our services around the Everything DiSC solutions today! Everything DiSC Workplace is a classroom training that uses online pre-work, engaging facilitation with contemporary video, and online follow-up to create a personalized learning experience. Participants understand and appreciate the styles of the people they work with. The result is more effective and productive working relationships. Everything DiSC Management is a classroom training that uses online pre-work, engaging facilitation with contemporary video, and online follow-up to create a personalized learning experience. Participants understand and appreciate the styles of the people they work with and manage. The result is more effective and productive working relationships. Everything DiSC Sales is a classroom training that uses online pr-work, engaging facilitation with contemporary video, and online follow-up to create a personalized learning experience. Participants learn how to read the styles of their customers. The results is salespeople who adapt their styles to connect better- and close more sales. Everything DiSC Work of Leaders is an individualized program that uses online pre-work, engaging facilitation with contemporary video and online follow-up to create a personalized learning experience. Participants learn their strengths and areas of improvement in regard to leadership styles. The result is a more effective and productive leader who understands how he or she can make an impact on the world. Workplace conflict is inevitable. Rather than focus on a step-by-step process for conflict resolution. 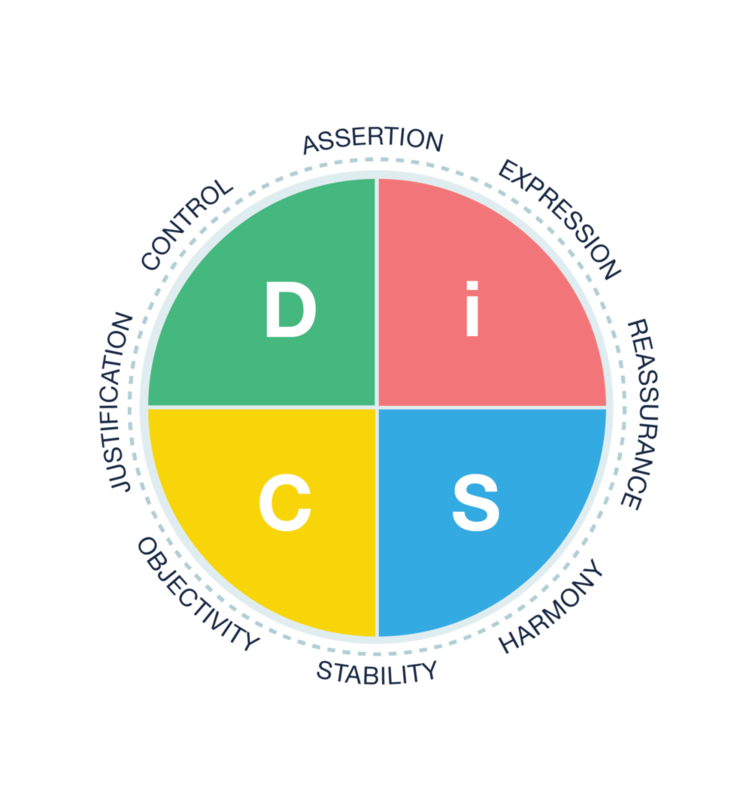 Everything DiSC Five Behaviors of a Cohesive Team helps learners curb destructive behaviors so that conflict can become more productive, ultimately improving workplace results and relationships. Everything DiSC Five Behaviors of a Cohesive Team helps learners increase self awareness around conflict behaviors and discover how to effectively respond to the uncomfortable and unavoidable challenges of workplace conflict. D style- People with this style are direct. They're outspoken with their opinions and aren't afraid to be forceful. C style- People with this style take a logical, systematic approach to their work and pride themselves on accuracy. i style- People with this style are bold and driven. They describe themselves as risk-takers and like to be at the center of the action. S style- People with this style are gentle and accommodating. They are patient with mistakes and very considerate of feelings.